We have received positive feedback from our long term and new customers regarding the ‘new look’ ClassiPress 4.x. A new update; 4.1.0 is now available. This new version addresses some minor fixes and comes with a couple of useful features. The new ClassiPress version: 4.1.0 addresses some minor issues that have been brought to our attention. Issues regarding the footer menu have been addressed in this version. Any issues with an AppThemes that are brought to our attention by our customers are always promptly dealt with. The new version comes with the ability to integrate the ‘AppMaps Module‘ plugins. While many users are happy using Google Maps, other users prefer to use alternative map providers such as Bing. 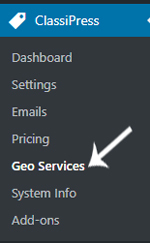 In the 4.1.0 version of ClassiPress, the ‘Maps Settings’ can be found under a new menu titled ‘Geo Services’. The maps provider and geocoding provider now have separated settings pages, which allows for different service providers and different API keys. The tabs under the Geo Services menu related directly to the additional ‘AppMaps Module’ plugin that you are using. The maps from different providers differ in look and functionality. Checkout our Bing AppMap or MapQuest AppMap marketplace plugins for an alternative to the default Google Maps. The “Location” field in the search form now implements the “Address Auto-suggest” feature from the ‘AppMaps’ module. It can use other services, such as “Bing Autosuggest API” or “Mapquest Place Search API”, not only the “Google Place Search API”. The screenshot below demonstrates the ‘Mapquest’ address auto-suggest feature. Smart radius has also been implemented for a ClassiPress location search. If the ‘Default Radius’ option is empty, location search will calculate radius depending on search request. For example, a search by country will cover all the country, not the standard 50 m/km from the center. 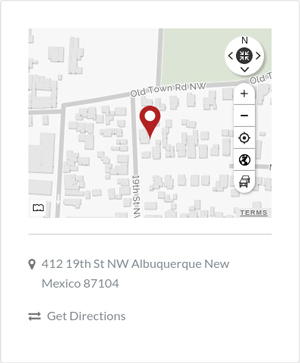 The shortcode above can also be added to a homepage to include a listings map as the header opposed to a static image. In terms of widgets, Post and Category ID filters have been added to: “Latest Listings”, “Featured Listings” and “Latest Blog Posts”. This allows you to filter your posts by either category ID or post ID. From ClassiPress version 4.1.0, WooCommerce template integration and basic styles will be available. This means that you can run a classifieds ad site where you also sell some products or services using the WooCommerce platform. We hope our valued customers enjoy the new features in ClassiPress 4.1.0. You can view all the changes and fixes for this version here. To help you adjust to these new improvements, we’ve included some relevant documentation links below. If for any reason you are having trouble with the new features of ClassiPress 4.1.0, our support team is ready to assist.